Our trip to Philippines was mainly focused on three topics: beach, sea and chill. We spent most of our time with our feet in the sand, on a boat, in the water or even underwater (post on scuba-diving is coming). We decided to visit the back country of Palawan Island just for a pleasant change. 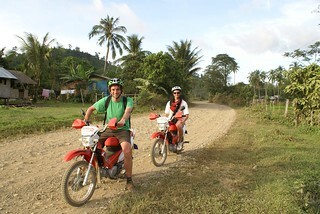 We rent motorbikes to be able to move easily on our own. Our trip to Philippines was full of misfortunes but we also got unforgettable moments. 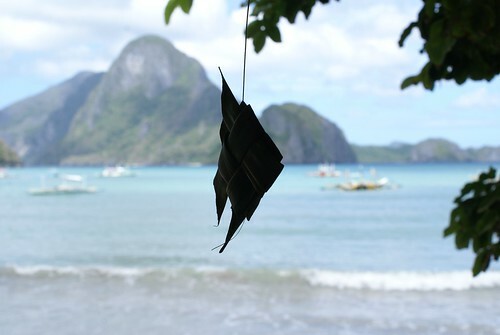 We spent most of our time at El Nido on Palawan Island. This small town starts to develop tourism but it is still simple and authentic. Two concrete examples are that no ATM is available in town (only cash is accepted) and electricity is power off from 10am to 6pm to save energy. 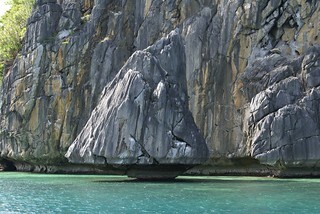 It is a mandatory crossing point for travelers who want to discover surroundings and particularly, the Bacuit Archipelago. Chinese New Year 2012 gave me the opportunity to travel again to my favorite destination for couple of years, South East Asia. I went with some French friends who lived in Beijing to Philippines, particularly Palawan Island. This trip was a chance to rediscover the Backpacker spirit as this country is still under development and tourism is not comparable to countries like Thailand or Bali. We got really good time as we were all motivated to learn about a new culture and new environment. Something important to highlight is that all Philippinos can speak English. It was an incredible change compared to our tourism experiences in Beijing or around China. I’d never realized it but speak the same language can facilitate lot of things.